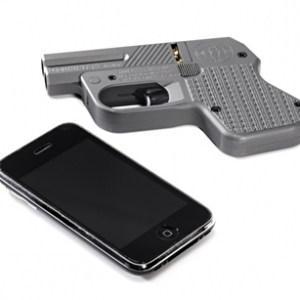 Heizer Defense LLC, a firearms company producing a new paradigm of pistols for the responsible-citizen and law enforcement markets is proud to introduce their first model for the concealed carry market; the DoubleTap. 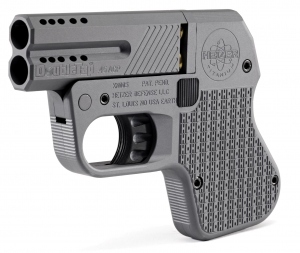 The DoubleTap™ is a tactical pocket pistol, loaded with 5 patents pending, built on a titanium or aluminum frame; the slimmest and lightest on the market today at only .665 inches wide and 14 ounces. 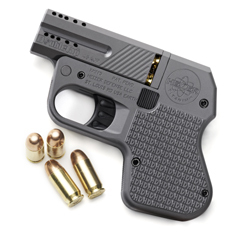 Available in a show-stopping .45 ACP or the more popular 9MM, this no-snag, hammerless designed pistol is completely designed, engineered and manufactured to the highest degree of precision and tolerances in an aerospace facility using aerospace technology and equipment. The DoubleTap™ carries two rounds in the chamber and the integral grips house two additional spare rounds. The break-action features a patent-pending progressive barrel porting option that cuts muzzle rise and recoil. The ambidextrous thumb latch releases the action and automatically ejects the spent rounds. Unlike any firearm, the DoubleTap features a truly revolutionary double-action trigger system that utilizes ball bearings for a smooth action and crisp trigger pull. The DoubleTap is available in a titanium or aluminum frame and is finished with a MIL-STD finish, the same used on military aircraft, for corrosion and wear resistant finish. Production guns will be available in the first quarter of 2012. 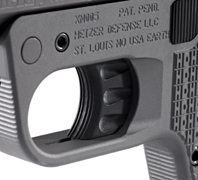 For more information visit www.heizerdefense.com and visit Heizer on Facebook. This entry was posted in Gun Reviews, Press Releases and tagged best .45 acp gun, best gun for ccw, best gun for self defense, best pocket gun, best pocket pistol, ccw, concealed carry gun, concealed carry pistol, doubletap pocket pistol, guns made in the usa, heizer firearms. Bookmark the permalink. I like it. Looks like you could easily carry it in your pocket without it printing. Women could easily carry it in their purse next to their cell phone. Probably will never become legal in California though. But I’ll watch for it. I will be interested in seeing this in person. It must be tough living in California. I can’t imagine. The laws are difficult enough here in Georgia! I agree about the pricing. The concept is good. Maybe the price will drop. WHAT ARE THEY SMOKING; THE PRICE IS FAR OUT OF LINE ! I CAN NOT SEE A DEALER STOCKING VERY MANEY OF THIS PRODUCT. Danny and I shot a similiar type of gun in August and the 45 ACP doesn’t kick like you think it might. The barrel is ported. I agree with you – I would feel more comfortable with more bullets. Two in the handle and two in the chamber gives you four shots. Why can’t my shotgun fit into my purse? AS A RESIDENT OF TEXAS WITH A CHL, TSRA CERTIFIED INSTRUCTOR AND NRA CERTIFIED RANGE SAFETY OFFICER AND AM EAGERLY WAITING FOR MY TITANIUM .45 ACP TO COME IN THEY WILL RELEASE THEM SOMETIME IN MAY OR JUNE. AS A GLOCK PERSON THIS WILL BE A PERFECT BACKUP FIREARM. FITS EASILY IN YOUR POCKET AND EXPECT GREAT THINGS FROM HEIZER. Why does everyone from Texas feel the need to write EVERYTHING IN FULL CAPS? Is it just that they’re so UNBELIEVABLY AWESOME & so totally TACTI-COOL that their awesomeness simply can’t be contained with lower case letters? HEY OUT THERE I’M RETIRED , A TEXAS RESIDENT FORMERLY LAW OFFICER, PRIVATE INVESTIGATOR, AND PRISON TEACHER. I USE CAPITOL LETTERS SO AS NOT TO HAVE A BATTLE OF WITS WITH AN UNARMED PERSON.THIS WEAPON WILL STOP A FOOL FROM CARRYING A KNIFE TO A GUNFIGHT!